Encore, encore! 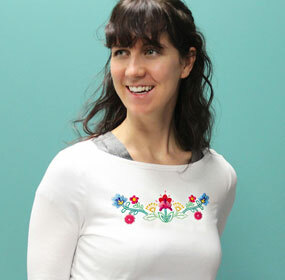 It's an embroidery encore weekend with brand new designs! Vibrant colors, whimsical details, and fun patterns -- what's not to love about these new Bohemian floral designs? 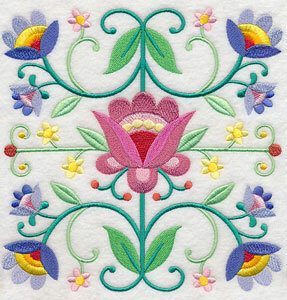 Whether you fall for the beautiful flower medleys or can't get enough of the single flower designs, these Bohemian motifs are terrific choices for adorning your next embroidery project. 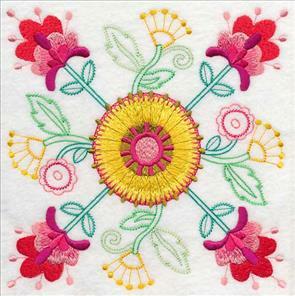 With squares, borders, sprays, and single flowers in both stitch-filled and "vintage" style, there are so many designs to choice from. Use all the flowers on a pretty quilt, or pick just one vintage design for a stunning tea towel. The opportunities are endless! 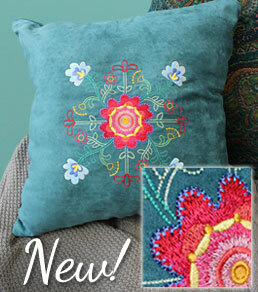 A vibrant pillow is the perfect backdrop for the bright colors of these pretty vintage-style Bohemian flowers. Traditional Bohemian culture refers to people who live an unconventional life, placing high importance on musical, artistic, and literary pursuits. The artwork of this culture is known for its bold use of color, symmetry, and intricate details. Each of these striking new floral designs embraces the long-established aspects of Bohemian artwork. 5.90" x 5.90" and 4.89" x 4.89"
5.90" x 5.90" and 4.90" x 4.90"
The Bohemian culture gets its roots in France, and that influence is present in its artwork. Within the culture, flowers hold great importance as they were originally used as an adornment in art and fashion, and were also noted as being used to make a political statement in common society. 7.80" x 7.79" and 6.90" x 6.89"
5.90" x 5.89" and 4.90" x 4.89"
7.75" x 7.80" and 6.86" x 6.90"
5.87" x 5.90" and 4.87" x 4.90"
The flowers in these embroidery designs represent the traditional Bohemian culture, and are spectacular additions to tote bags, pillows, and other embroidery projects. Stitch your favorite design alone, or pair a few to make a stunning statement piece. 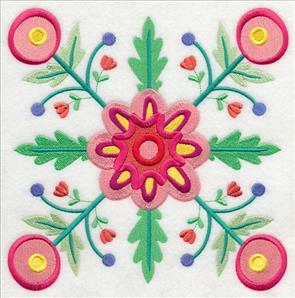 7.80" x 7.79" and 6.90" x 6.90"
The next time you're stitchin' for the kitchen, add a burst of fun flair to your projects with one of these Bohemian flower designs. 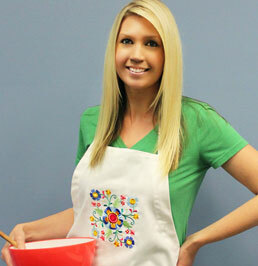 They're creative additions to aprons, table linens, oven mitts, and more! 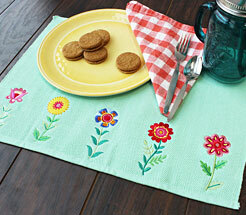 This stitch-filled border design is delightful on table linens, shirt and skirt hems, lightweight towels, and more! 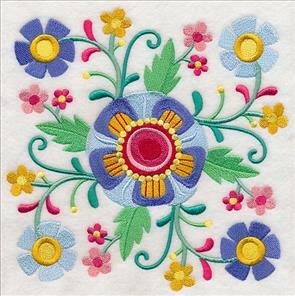 The use of symmetry and vivid colors in the machine embroidery design gives it a pleasing Bohemian-style look. 7.80" x 2.48" and 6.90" x 2.20" and 5.90" x 1.88" and 4.90" x 1.56" and 3.90" x 1.24"
The bouquet of flowers in this design make it the perfect choice for updating linens for spring and summer. We love the idea of stitching it on curtains, quilts, and so much more! 7.80" x 2.53" and 6.90" x 2.24" and 5.90" x 1.91" and 4.90" x 1.59" and 3.90" x 1.26"
This beautiful display of flowers is a wonderful addition to a shirt, towel, and table linens. It's a great way to add color to your projects! 7.80" x 2.48" and 6.90" x 2.19" and 5.90" x 1.87" and 4.90" x 1.56" and 3.90" x 1.25"
Each of these impressive, colorful floral sprays are fantastic ways to show off classic Bohemian style. Try one on jacket backs, placemats, wall hangings, and more. 5.86" x 11.75" and 4.72" x 9.40"
3.92" x 7.80" and 3.45" x 6.85"
5.64" x 11.75" and 4.51" x 9.41"
3.74" x 7.81" and 3.29" x 6.86"
6.43" x 11.75" and 5.16" x 9.41"
4.28" x 7.81" and 3.76" x 6.87"
If you're looking for a simpler design in the Bohemian style, try one of these sweet flower designs. 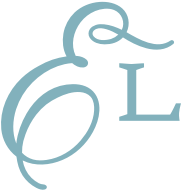 They're great ways to adorn shirts, home decor items, and more! 3.24" x 7.80" and 2.86" x 6.90"
2.45" x 5.90" and 2.03" x 4.90"
3.17" x 7.80" and 2.80" x 6.90"
2.40" x 5.90" and 2.00" x 4.90"
3.21" x 7.80" and 2.84" x 6.90"
2.43" x 5.90" and 2.02" x 4.90"
Let one of these beautiful Bohemian flowers bloom on towels, table linens, or wall hangings. 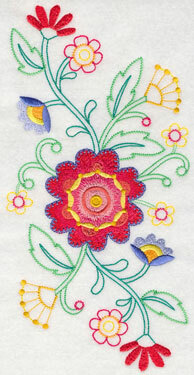 The bright colors and thick lines achieve a stunning effect that's perfect for stitching on your next project. 3.10" x 7.80" and 2.75" x 6.90"
2.35" x 5.90" and 1.95" x 4.90"
3.33" x 7.80" and 2.94" x 6.90"
2.52" x 5.90" and 2.09" x 4.90"
3.30" x 7.80" and 2.92" x 6.90"
2.50" x 5.90" and 2.07" x 4.90"
A row of pretty flowers looks garden-ready on a light green placemat! 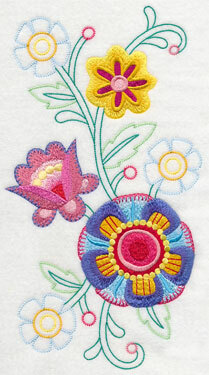 Stitching the flowers in a group gives a cohesive look to the project. Try these stitch-filled designs as terrific additions to a variety of projects. Pick your favorites by using the links above, or get all 18 bohemian designs in a design pack. 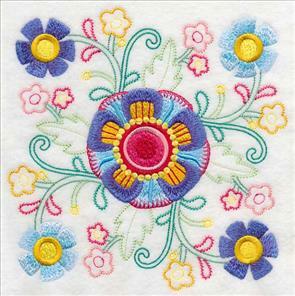 Each of the floral designs has also been stitched in the "vintage" style of embroidery. 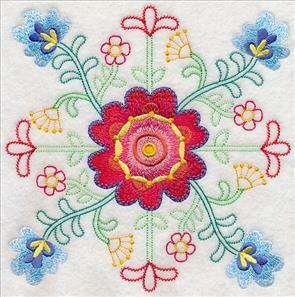 This style is known for its light and airy stitches, and looks best when stitched on smooth and neutral fabrics, such as quilter's cotton, linen, canvas, and similar materials. 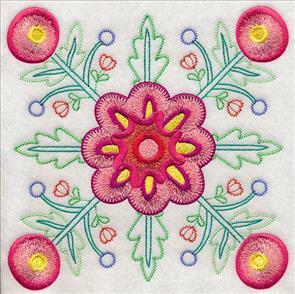 7.80" x 7.80" and 6.88" x 6.90"
5.89" x 5.90" and 4.89" x 4.90"
The Bohemian blooms are particularly beautiful additions to embroidery projects such as low-nap towels, tote bags, quilts, and bed and table linens. 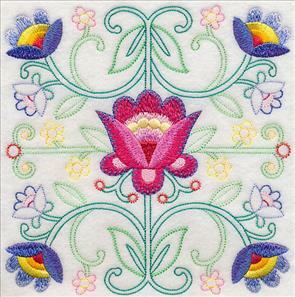 They offer a softer, more delicate take on the lively, intricate designs, and are stunning additions to any project. 7.79" x 7.80" and 6.89" x 6.90"
7.74" x 7.80" and 6.82" x 6.90"
5.86" x 5.90" and 4.85" x 4.90"
Each of the energetic flower designs is a fabulous choice on its own, but the designs are especially impressive when stitched as a group. Create a quilt with the whole collection, or use them to make a collage of beautiful wall hangings. 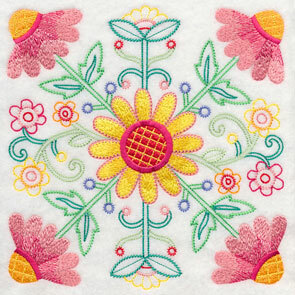 7.78" x 7.80" and 6.89" x 6.91"
Add a hint of whimsy to your embroidery projects with a border design (Bohemian-style!). 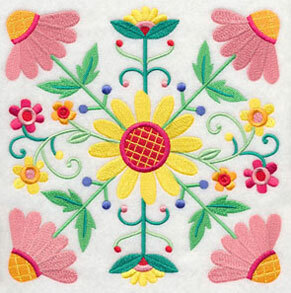 This gorgeous floral motif is great on tea towels, pillow cases, and placemats. 7.80" x 2.51" and 6.90" x 2.23" and 5.90" x 1.91" and 4.90" x 1.58" and 3.90" x 1.26"
Give your bath towels, table linens, and purses a floral edge with this Bohemian border. 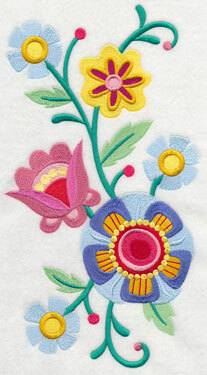 It's a colorful addition to your embroidery collection. 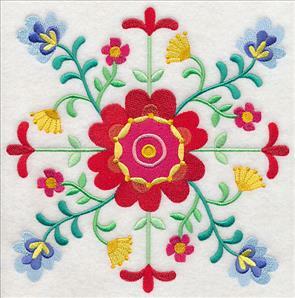 7.80" x 2.54" and 6.90" x 2.24" and 5.90" x 1.92" and 4.90" x 1.59" and 3.90" x 1.27"
A beautiful flower is flanked by its floral friends in this gorgeous border design. Try it on a variety of projects, including wallets, napkins, and hand towels. 7.79" x 2.56" and 6.89" x 2.27" and 5.90" x 1.95" and 4.90" x 1.62" and 3.90" x 1.30"
Transform a simple shirt into a fashionista's dream with one of these lovely floral borders. The bright colors and pretty design are perfect for spicing up your wardrobe! 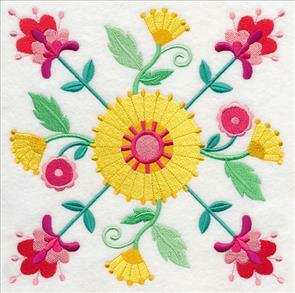 Intricate vintage-style embroidery sprays full of vibrant flowers and fun colors are beautiful on quilts, shirts, linens, and more. 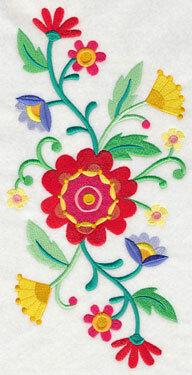 The bright and bold flowers are inspired by traditional Bohemian style. 5.88" x 11.75" and 4.71" x 9.40"
3.91" x 7.81" and 3.45" x 6.90"
5.69" x 11.75" and 4.56" x 9.41"
3.79" x 7.81" and 3.34" x 6.86"
6.45" x 11.75" and 5.17" x 9.41"
4.29" x 7.80" and 3.79" x 6.89"
Each of these single flower designs are magnificent on denim jackets and shirts, totes, towels, and pillow covers. Stitch them alone, or as a group for awesome results. 3.24" x 7.80" and 2.87" x 6.90"
2.46" x 5.90" and 2.05" x 4.90"
3.20" x 7.80" and 2.83" x 6.90"
2.42" x 5.90" and 2.00" x 4.90"
3.26" x 7.80" and 2.89" x 6.90"
2.47" x 5.90" and 2.05" x 4.90"
If you're looking for a creative way to use the single flower designs, try lining the blooms up in a line to make a personalized border. We love utilizing this idea on placemats, tablecloths, or blankets. 3.12" x 7.80" and 2.76" x 6.90"
2.36" x 5.90" and 1.96" x 4.90"
2.43" x 5.90" and 2.03" x 4.90"
Vintage-style Bohemian flowers add a colorful, eye-catching look to any embroidery project. Order your favorite individually by using the links above, or get all 18 bohemian designs in a design pack!